Secret Rainbow Hair Is So Cool! Of all the crazy and cool hair trends we’ve spotted this year, this one definitely lands on the top spot. Presenting the Secret Rainbow Hair! Insane, right? What looks like regular dark-colored hair actually has a very colorful secret underneath. Only the lower layers of the hair are bleached and dyed with bright colors, while the upper layer is left with a dark hue. The result? 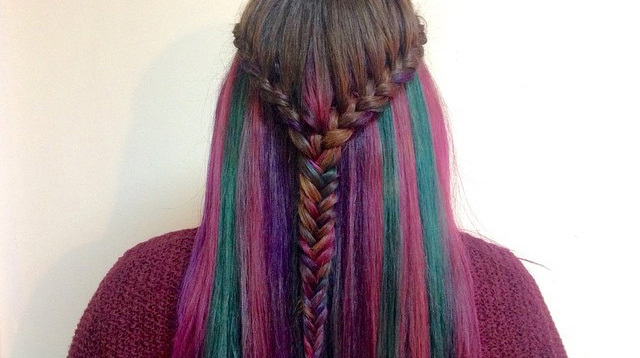 Cleverly hidden rainbow hair! It's totes perfect for girls who want to get colored hair but aren't ready for a drastic change! Plus, you'll end up with super cool hairstyles!